Under the code name Wahoo! they operate in their own unique way and move the dancers with Jazz, Soul, Funk, Reggae, Rhythm & Blues, Afro, Disco, and Latin from the past and present. 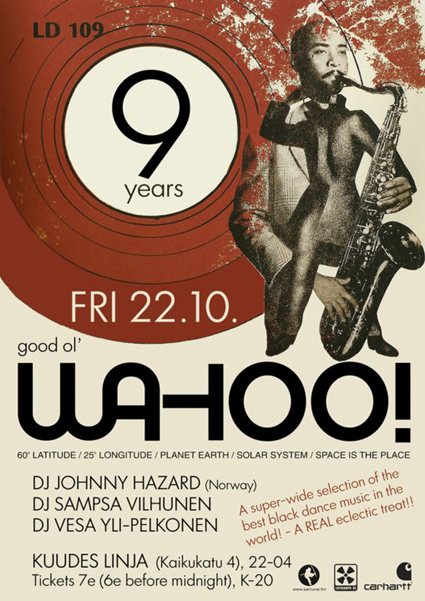 This Friday residents Sampsa Vilhunen and Vesa Yli-Pelkonen celebrate the 9 years Wahoo! anniversary with another super-wide selection of music styles. Also their buddy DJ Johnny Hazard comes around from Norway to wish a happy birthday with some special rhythms. If you want to receive an impression of how the bash might sound just listen to their Club Wahoo! 100th Show Special on Samurai FM.